RAMALLAH, occupied West Bank (IPS) – The International Committee of the Red Cross has warned that Gaza’s access to safe supply of drinking water could cease at any time. The World Health Organization (WHO) says outbreaks of disease could be triggered as a consequence. “We have noticed an increase in people suffering from kidney diseases from water contaminated with toxins, as well as babies born with an unnatural blue tinge,” Munther Shoblak from Gaza’s Coastal Municipalities Water Utility (CMWU) told IPS. The UNEP report focuses on a rise in saltwater intrusion from the sea caused by over-extraction of ground water, and pollution from sewage and agricultural run-off, with toxic levels high enough to put infants at risk of nitrate poisoning. Gaza’s underground aquifer is the sole water source for its 1.5 million people. Only 5-10 percent of the water now is fit for human consumption. The average per capita daily consumption of water for personal and domestic use in Gaza is 91 liters. WHO recommends 100-150 liters daily. Israelis consume 280 liters per day. The UN Office for the Coordination of Humanitarian Affairs (OCHA) reported last week that at least 10,000 Gazans remain without access to the water network. Furthermore, access to water is limited on average to six to eight hours from one to four days a week for the entire population. “Approximately 150-160 million cubic meters (mcm) are extracted from Gaza’s underground aquifer annually. Due to a regional drought over the last few years only about 65 mcm has flown back into the aquifer annually. This leaves a shortfall of 100 mcm,” says Shoblak. Sewage-contaminated seawater and agricultural overflow contaminated with toxins have been flowing into the aquifer’s deficit. The CMWU is only able to partially treat some of the 80 million liters of sewage pumped out to sea on a daily basis due to a shortage of spare parts, fuel, and electricity cuts. During Israel’s bombardment of Gaza during the December-January war, the strip’s already degraded infrastructure was heavily targeted. CMWU estimates that about six million dollars worth damage was caused to major water and sanitation infrastructure during Operation Cast Lead, Israel’s code name for its war. Over 30 kilometers of water networks were damaged or destroyed by the Israeli military in addition to 11 wells operated by the water authorities in Gaza. More than 6,000 roof tanks and 840 household connections were damaged. There is an urgent need for cement, pipes, pumps, transformers and electrical spare parts to implement numerous projects in the water and wastewater sector. Some 1,250 tons of cement are currently needed for the repair of water storage tanks alone. But Israel’s blockade prevents cement from being brought into Gaza. Javier Cordoba, the ICRC water and habitation coordinator who is supervising Red Cross reconstruction efforts in Gaza says the situation is very fragile. “A lack of construction material and parts has led to a de-development of the water infrastructure, which could collapse at any minute,” Cordoba told IPS. Electricity shortages force the wells to rely on back-up generators. Israel’s blockade not only limits electricity supplies but the supply of industrial fuel too. The ICRC has been working on ingenious methods to get around the blockade to bring temporary relief to Gazans. “We have managed to build a new, albeit primitive, wastewater plant in Rafah in the south of Gaza. We used pieces of the wall which used to divide Gaza from the Sinai peninsula, before the wall was blown up last year, for the basic structure. UNEP estimates that more than $1.5 billion may be needed over 20 years to restore the aquifer back to health, including the establishment of desalination plants to take pressure off the underground water supplies. Fighting between Hamas forces and al-Jamaa al-Salafiya al-Jihadya in Palestine has left at least 16 people dead, after a Sheikh called for the Gaza Strip to be ruled by Sharia (Islamic law). Al Jazeera’s Ayman Mohyeldin reports. Many aspects of life in Gaza have suffered under the Israeli blockade and Palestinian culture is just one of them. But amid the trauma of withstanding worsening living conditions, Palestinians from the impoverished territory have managed to produce the first feature film to come out of Gaza in almost a decade. Al Jazeera’s Ayman Mohyeldin reports on the Hamas-funded film about a hero of the movement’s armed wing. Palestinian leader Mahmoud Abbas’ Fatah faction has begun a congress – its first in 20 years. Speaking at the congress, Mr Abbas said Palestinians sought peace with Israel but “resistance” remained an option. Fatah is widely seen as corrupt and ineffective, the BBC’s Middle East correspondent Tim Franks says. Our correspondent says there will be close interest in who is elected to the faction’s main internal positions of power. Some 2,000 delegates are convening for Fatah’s three-day congress in the West Bank town of Bethlehem. An estimated 400 Fatah delegates who live in the Gaza Strip were banned from travelling to Bethlehem for the conference by the territory’s rulers, Hamas. Israel had allowed about 500 delegates who live abroad to travel to the congress. “Having the conference at all is a miracle, and having it in the homeland is another miracle,” Mr Abbas said on Tuesday. The congress will be discussing a new platform that seeks to rejuvenate the movement. 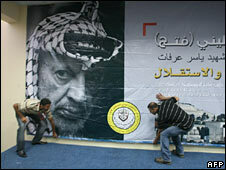 Another key test will be whether the conference alters the wording of Fatah’s charter, which refers to eradicating Israel. The draft document proposes to keep the option of “armed struggle” if peace talks with Israel fail. It also says that an Israeli settlement freeze in the West Bank is a precondition for any further talks with Israel. The congress comes as the US is hoping to broker a new round of peace talks between the Israelis and Palestinians. Maybe more important is the issue of who the delegates elect to the internal positions of power, our correspondent says. He adds that – in the words of one reformer – the current leaders are like princes in the Gulf. Opinion polls still suggest that Fatah is currently more popular than its main rival – the Islamist Hamas movement which controls the Gaza Strip. But without a strong infusion of freshness, in the long-term Palestinians say that Fatah will only decline, our correspondent says. Israel said its 22-day military operation in Gaza in January was aimed at ending rocket fire from Hamas, and weakening the Islamic movement that controls the coastal Strip. Six months after the conflict, three Gazans affected by it give their views on Hamas’s standing in Gaza. 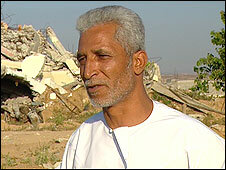 Youssef Abu Eida’s four-floor house, home to his eight children and other extended family members, was destroyed during the conflict. Construction materials are blocked from entering Gaza under Israel’s blockade, so he has not been able to begin rebuilding. “Nothing has changed. Each month I feel worse. I got mad. Now I am living in Jabaliya camp, with 12 people in one bedroom. “Hamas and the Jews both did this. Hamas don’t have the power for war – so why did they launch rockets at Israel? Israel needed war here, but who gave Israel the key to come here? Hamas. “They say ‘no problem’. But there is a problem! They take everything, clothes, milk food, everything. I think a lot of money comes into Gaza – where is it? For who? Who has taken all the money? What have Hamas done for my family? “There are 1.5m people in Gaza – are all of them Hamas? No, they are not. You can ask my son, does he need Hamas? Does he like Hamas? No. 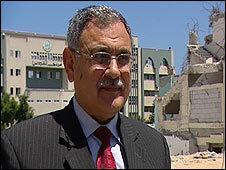 Kamalain Shaat is head of Gaza’s Islamic University, which is widely seen as close to Hamas. Some of the university’s buildings were destroyed in Israeli airstrikes – Israel said it targeted a chemistry laboratory used to make explosives. “We have lost two main buildings, including all our science college labs – but we decided from day one that we have to continue with life. Right now we are offering our students educational services with maybe 90% efficiency, with the minimal resources we have. “I am not sure about the popularity of Hamas. 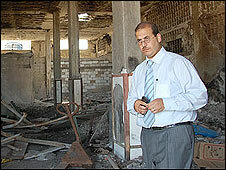 But what is really clear is that five missiles targeted two educational institutions, which is not acceptable at all. The Israeli army didn’t deny this, so they are to blame of course. “Hamas came in by election. I don’t think anything would change if there was an election tomorrow. The people here are suffering, but they are persistent not to give up. 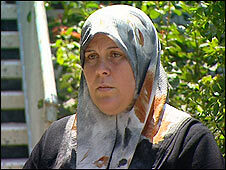 Tihani Abed Rabbu’s teenage son Mustafa, her brother and her closest friend were all killed during the conflict. “After six months, life is hell. I can’t understand, I can’t absorb it. None of us can go back to normal life, not me, not my children, nor my husband. “It’s not easy to forget the memory, to get rid of the image from your mind. Also there is no security. The Israelis could attack again, the Fatah and Hamas conflict could ignite again. “What worries me is the safety of my family, my sons and my husband. My husband is going through a difficult time, a crazy time. He wants to affiliate with Hamas, he wants to get revenge after what they have done to us. “How do you expect us to be peaceful after they have killed my son and turned my family into angry people – as they refer to us, “terrorists”. I cannot calm my family down. “One of my sons is affiliated to [Palestinian Authority President Mahmoud] Abbas, every day he fights with his brothers and his father. “If Fatah and Hamas don’t reconcile after this war, I feel like all those people who died, died for nothing, and that the people from both factions have nothing to do with the Palestinian cause – that they are not paying respect to those who died.